At around 80 million strong, Millennials are now the largest generation in American history, and they hold over $200 billion in combined spending power. At the same time, it’s becoming increasingly clear that the traditional playbook doesn’t work for this new generation. Only 1% of Millennials trust traditional advertising, and they represent a target that’s both tempting and elusive for marketers. Millennials seek authentic, personal connections with brands, and rely on word-of-mouth recommendations from friends—and that’s why referral is one of the most powerful strategies for reaching them. We’ve seen this firsthand at Extole. But you won’t get Millennials to refer your brand if you fall prey to the endless stereotypes of them as constantly glued to their phones, lazy, and in debt. Millennials have sophisticated and discerning patterns of consumption that can’t be reduced to sweeping generalizations. You need to dig into the actual behavior that distinguishes them from the generations that have come before in order to drive effective outreach. We dove into the data from Extole’s platform to analyze how different generations engage with brands through referral. 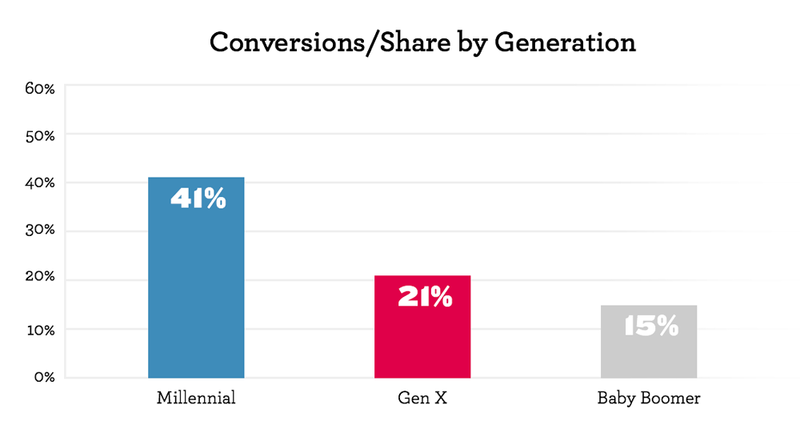 What we found was fascinating—while every group refers, there were significant differences in the amount of referral shares and conversions between Millennials (born 1985-2004) and Gen X (born 1965-1984). 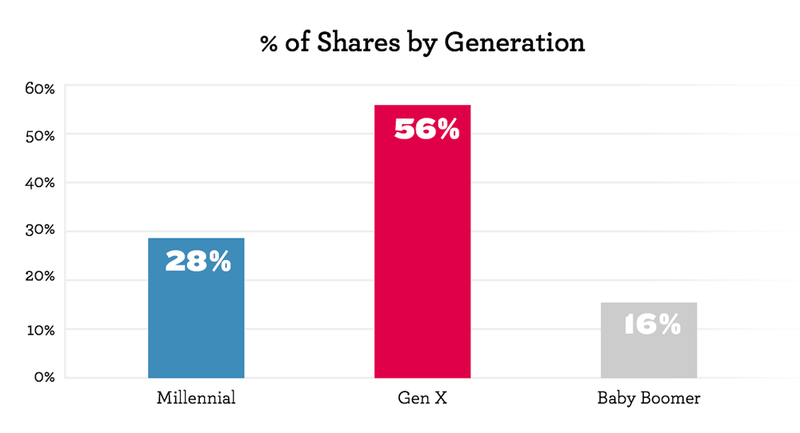 The takeaway: Both generations share plenty of referrals, but Gen X shares more. However, Millennials send better-targeted referrals that convert at a much higher rate. Referral taps into Millennials’ preference for personal endorsements over conventional advertising, and they know how to reach friends who are likely to become customers. Let’s examine how you can tap into these trends and tailor your referral program to take advantage of the massive opportunity Millennials present. Who would have thought that the middle-aged Gen Xers would be twice as likely to share a referral as the notoriously tech-savvy Millennials? Of the advocates in our sample size, 56% were Gen Xers, 28% were Millennials, and 16% were Baby Boomers. It’s initially shocking, but not when you stop and think about how Millennials interact with companies. That’s why something like Oreo’s LGBT pride-inspired ad in 2012 was so successful. Do LGBT rights don’t have anything to do with cookies? No. But that made it all the more impressive that Oreo stuck its neck out and took a stance on a contentious social issue lots of Millennials feel strongly about. The willingness to risk a backlash made the ad feel more genuine to Millennials. Millennials are willing to advocate, but not for just any company. They demand a different kind of engagement than other generations. Not only do they need to believe your product is great, but they need to feel a genuine connection with your company. If your brand and your referral program resonate with Millennials on a personal level, you have a huge opportunity. Another surprise—despite making up a lower share of advocates, Millennials are nearly equal with Gen X when it comes to accepting referrals. 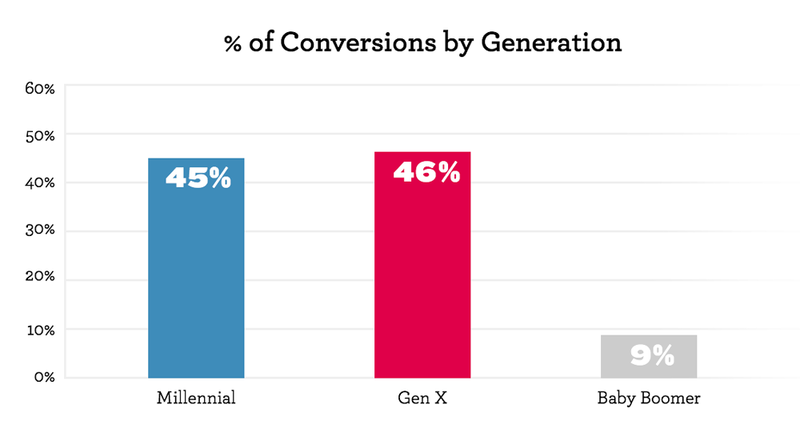 Of everyone who converted to a customer after receiving a referral, 46% were Gen Xers, 45% were Millennials, and 9% were Baby Boomers. This trend speaks to the importance Millennials place on social proof. 59% of Millennials say they’re swayed by friends’ opinions, more than any other age group. Not only that, but 28% say they won’t even try a product their friends don’t approve of. Word of mouth endorsement is important to every cohort, but the degree to which it dictates Millennials’ tastes is unprecedented. In addition to taking friends’ recommendations, Millennials also love to play the influencer role—more than half say that others seek them out for brand opinions. Social media is the perfect outlet for Millennials to spread their influence and get suggestions from peers—hence why more than half of them make brand recommendations and referrals on social platforms. Those posts reach a wider audience and get more attention—referrals shared on Facebook, for example, average an 80% clickthrough rate compared to just 55% on email. These trends don’t just explain why Millennials are so open to referral. They also show why optimizing your referral program for social media needs to be a priority. When Millennials want to know more about a company, they look to their friends on Facebook and Twitter. If they get a referral from the right person at the right time, you have a great chance of converting an excited new customer. Here’s where things get really interesting. Across the Extole platform, each share sent by a Millennial advocate converted at a rate of 41%. For Gen X advocates, the number was 21%, and for Baby Boomers, 15%. Millennials may not send many referrals, but the ones they do send convert at a much higher rate. Looking at the previous two graphs, the math checks out. Millennials send fewer referrals than Gen Xers but just as many become customers—you’d expect a higher percentage of Millennial advocates’ recipients must be converting. That suggests that Millennials are sending better-targeted referrals, and the trends support that idea. In their world, social proof is paramount. Millennials don’t just want to be aligned with one another—they want to be the tastemakers of their friends. So they identify the brands that meet their unique criteria for engagement and share them with likeminded compadres—people they know that brand will resonate with. And a huge amount of this takes place on referral-friendly social media platforms. It all boils down to this: Millennials make referral count. They don’t want to waste time on duds, so they’re choosier with the brands they’ll advocate for. They think long and hard about which of their friends to refer—and those friends are clearly willing to listen. They’re a tough nut to crack. But if you have a brand that resonates with them and a referral program that gets them excited, Millennial advocates will get you access to a network eager to try your product and eventually refer friends of their own. That’s what makes them such a valuable target for your referral program. How can you tap into these high-value advocates? Here are three strategies to get more Millennials into your referral program. 1. The human element. Millennials need to see brand authenticity to recommend your company, so your referral program can’t feel like a dry marketing scheme. Make your referral program a personal experience. Write copy in your referral message reflects your company’s personality, and incorporate the name and picture of the advocate as much as possible—it should feel like a thoughtful, tailored recommendation from a friend more than anything else. 2. Optimize for social media. Social proof—providing and receiving it—is crucial to Millennials. Social media is the best way to play to that. For example, when someone shares one of your referrals on Facebook, give them options to tag specific friends and to post on other platforms, or offer extra rewards for referrals over social media. 3. Reward them. Remember, influencing friends through product recommendations is an important part of Millennials’ self-identity. They’re putting their reputations on the line every time they make a referral, so reward them when they do a good job. One idea could be to surprise top advocates out of the blue with extra rewards. Or, if an advocate sends a particularly impressive personal message with their referral, recognize them on your site. That confirms to your advocates that they’re great at converting people to your product and bolsters their personal connection with your brand. These are best practices for any referral program, and can increase engagement with any generation. But they’re absolutely necessary to get significant advocacy from Millennials given their unique consumption patterns. To build a referral program that appeals to everyone, you need to account for generational differences. Millennials demand a more personal, social marketing experience—that’s the only way they’ll advocate your brand. And guess what? *Everyone* wants that experience. So don’t think that by taking these steps you’ll be favoring one age group and neglecting the other. If you target Millennials more effectively, you’ll see higher engagement across the board. So get out there and build a referral program that applies to anyone, whether they’re 8 or 88.